date back to allow more time for riders to get properly geared up. Summer Olympics which were held in Moscow. dressage gold and led the team from West Germany to team gold. With some organizations, including the United States Pony Club, the United States Combined Training Association (now United States Eventing Association) and finally the AHSA requiring some riders to wear helmets, new customers were entering the market for safety gear. Manufacturers answered the demand with improved styles, including a western hat fitted with a protective helmet. 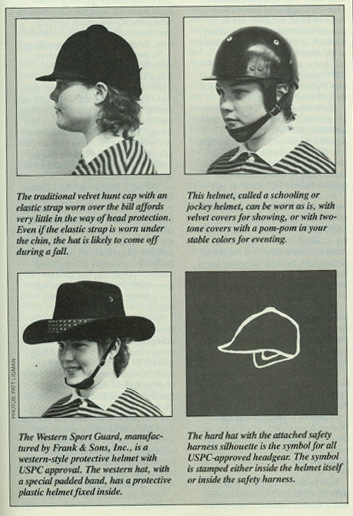 One could also surmise that riders in the 1980s were very concerned with scraping their chins in the case of a fall, thus the universality of chin straps that covered the chin rather than going underneath.